Tobago offers some of the best diving in the Caribbean. With over 400 hundred diﬀerent species of ﬁsh & sea creatures, there is so much for divers to see. There are beautiful reefs as well as the largest brain coral in the world. Being a small island you are never far from one of Tobago’s beautiful beaches. 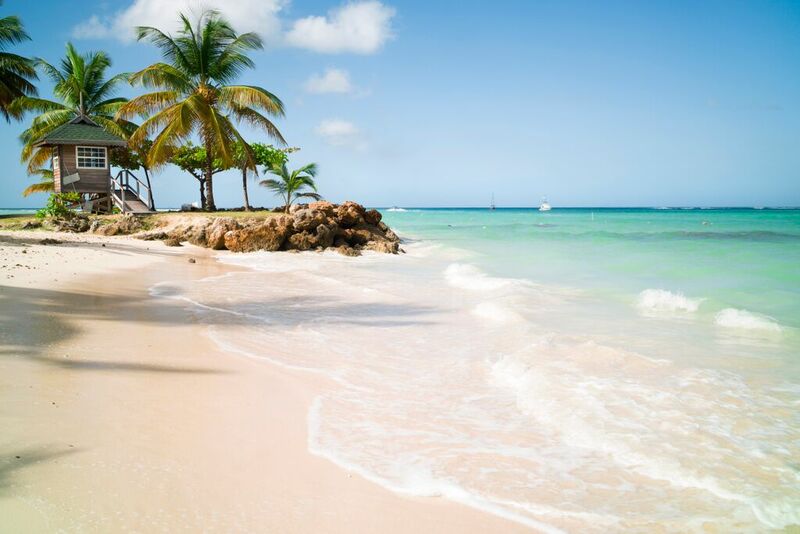 Idyllic white sand, blue seas, and palm trees. Some beaches are only accessible by boat but most of them can be reached by car or by foot. Tobago’s Main Ridge forest is the oldest forest reserve in the western hemisphere, dating from 1765, and the combination of hills and trees create many lovely little waterfalls where you can cool down while on a trek. 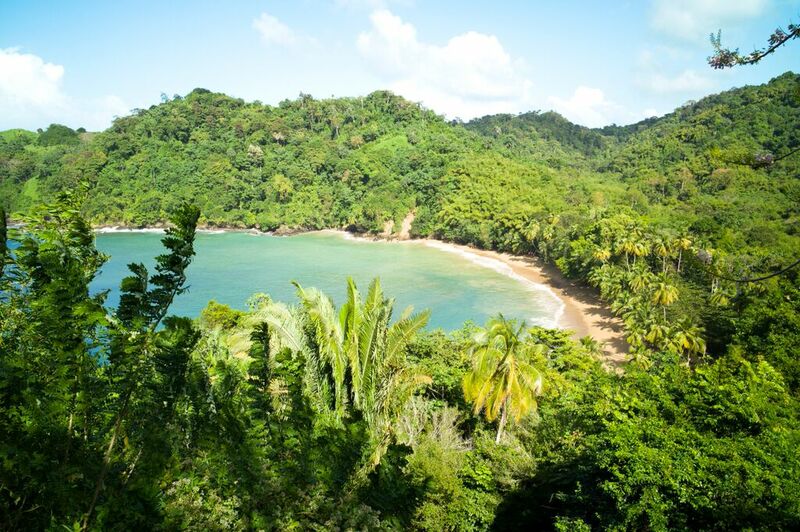 In perfect contrast to the green of the forest is the bright blue of Tobago’s many sunny beaches, palm‐fringed to provide that quintessential hammock and rum punch setting. In Tobago life is slow. Everyone takes the time to stop and talk or “lime” with friends both old and new. But know that there is an alternative, underwater world, just as amazing as the one on land, and oﬀering some of the best diving in the Caribbean. 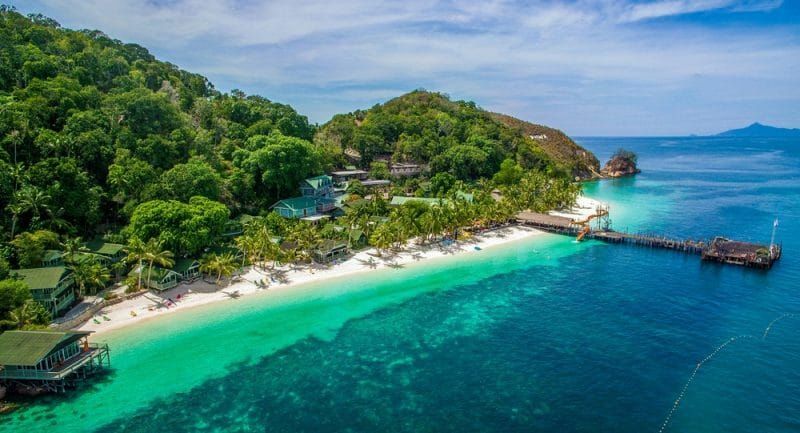 Tobago’s waters are nutrient‐rich due to the overﬂow from the Orinoco River in Venezuela, and at times the top few feet of the water can be green. But this is a bonus, this is what brings the marine life here and why everything is so much larger than other dive locations. Most of the dives on the island are drift dives. You enter from the boat at the start of the reef and just go with it. 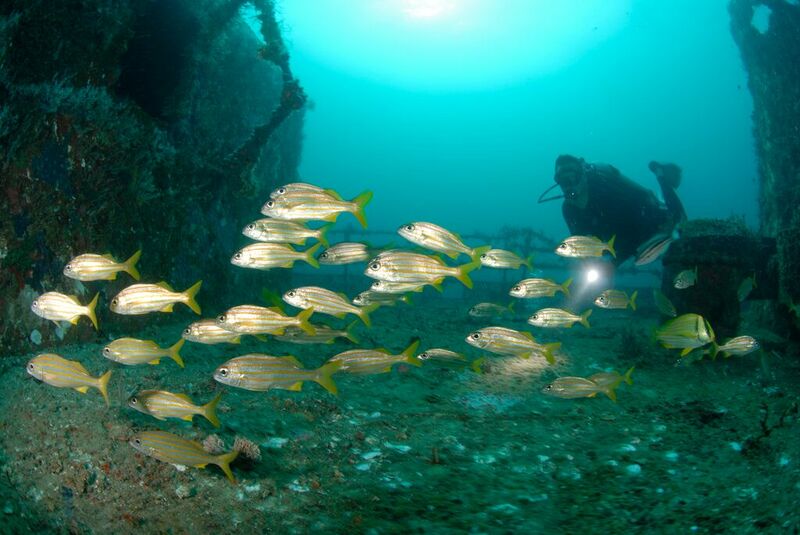 Depending on your level of experience, you can dive in a nice gentle drift (ideal holiday diving as you don’t have a lot of ﬁnning to do) and enjoy the ﬁsh that are all around you, or more experienced divers – who thirst for the thrills – can expect some much stronger currents out there. You will drift across tube sponges, barrel sponges, brain corals and sea fans. You will see blue wrasse, queen triggerﬁsh, angel ﬁsh, schools of Caribbean reef squid, turtles, and a whole lot more. If you are not yet a certiﬁed diver then Tobago is the ideal place to learn. 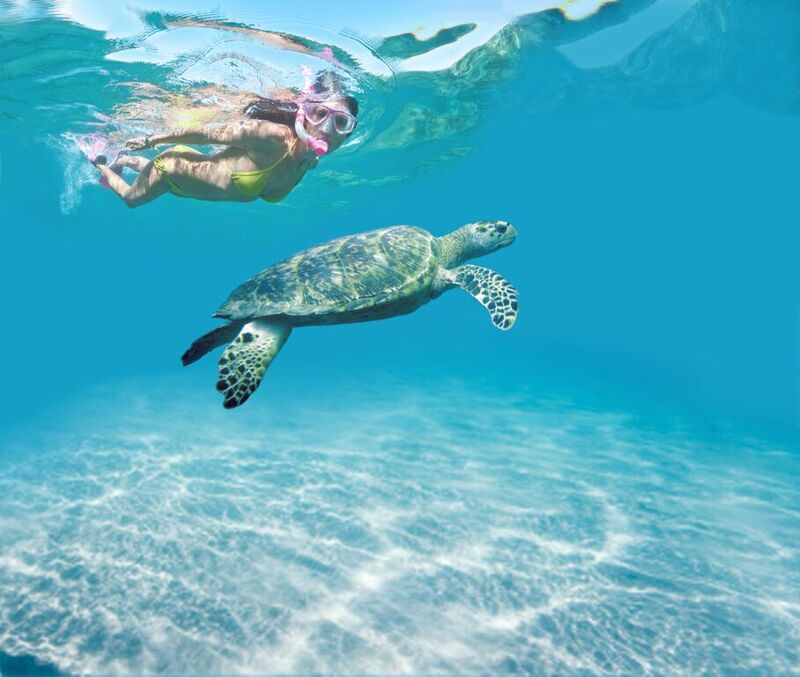 With water temperatures around 24 – 26 degrees year‐round and so much to see, it is the perfect place to start. If you are already certiﬁed but want to take your diving to the next level then it’s perfect for you too. The only restrictions are that you have to be 10 years or over and medically ﬁt. Tobago is also a perfect diving destination for disabled divers who truly enjoy the freedom of being in the water. If diving at Cove Ledge, don’t forget to look under the ledges where you will often come across a sleeping nurse shark. Also keep an eye out for the Elkhorn coral which is quiet rare down the south end of the island. Cove Ledge is a shallow dive only 5 – 14 metres and the reef has mainly hard corals with numerous ledges & cracks. Here, there is usually a gentle surge unless the seas are rough, and then it can be quiet powerful. No prizes for guessing what you are likely to see on this dive. Not only are the rays swimming around you, but if you watch the sand you will see their moving eyes. If disturbed while buried in the sand, the rays take oﬀ with a majestic ﬂap of their wings. The majority of the rays are Southern Stingrays but you can also ﬁnd Lesser Electric Rays. 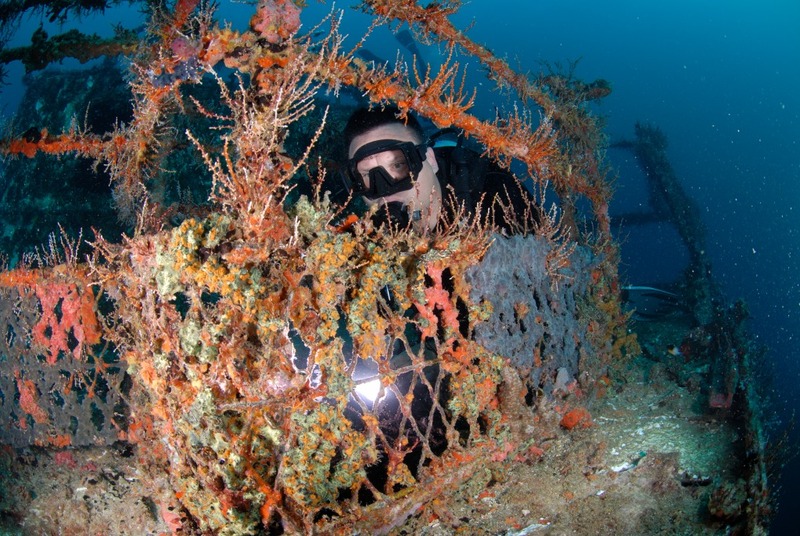 The depth of the reef is between 9 – 16 metres made up of large boulders covered in sea fans, sponges & large holes. A lot of holes will contain Moray Eels, but don’t go too near as they are pretty large! The head will give you a good idea of its size, but occasionally one will swim out, and although they are not long, their size makes up for their length. For those of you who enjoy the smaller marine life, then Mount Irvine Wall has so much to oﬀer. This dive is between 6 – 15 metres. The wall is a rocky outcrop which extends out to sea. There is usually a surge on this dive. 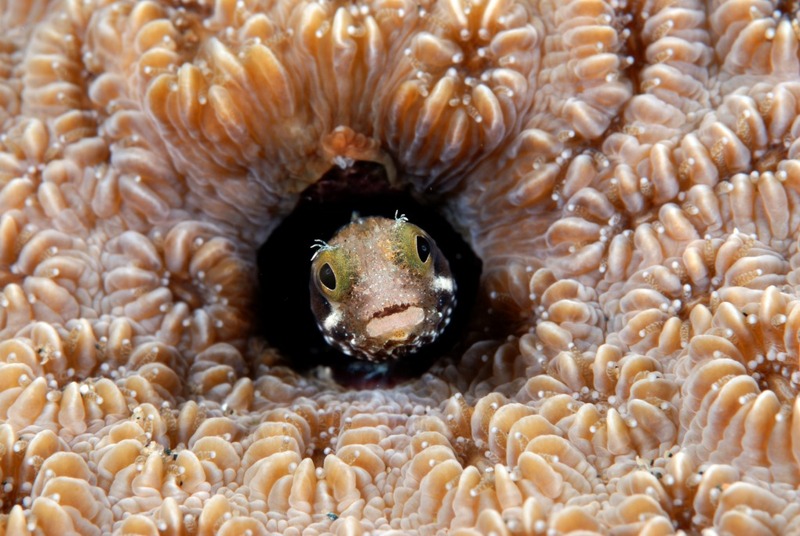 Watch out for the tiny Secretary Blennies, Banded Shrimp which oﬀer a wonderful cleaning station, and juvenile Spotted Drums, Yellowtail Damselﬁsh, Flamingo Tongues and Sea Goddess. There is always the chance of spotting a Seahorse, but they are really diﬃcult to ﬁnd as they blend in so well with their surroundings. If you do ﬁnd one, they are usually happy to pose for photographs. And don’t forget to look in the holes for Octopus. The Maverick is another favourite. 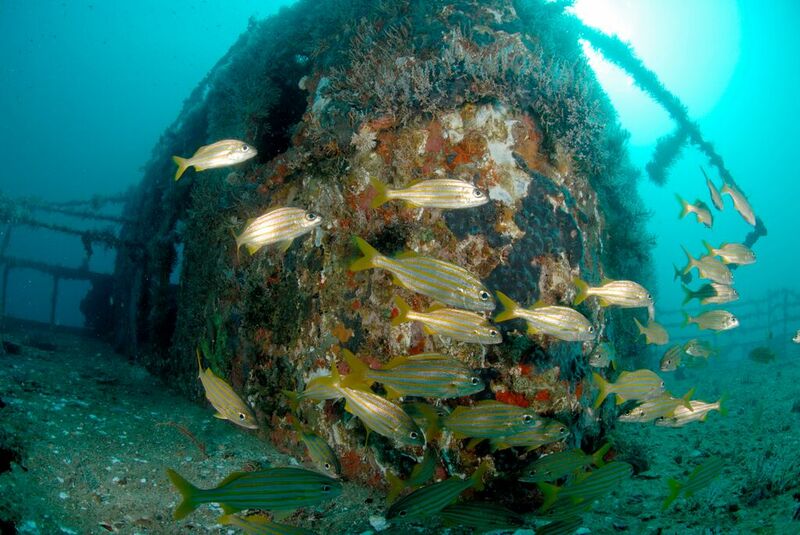 This is an old cargo ferry that was sunk on 7th April 1997 especially for diving. She sits on the sand in 30 metres of water and has provided a home for a number of diﬀerent species over the years. At one point there was a huge Goliath Grouper down there who is believed to have weighed well over 350 lbs (depending on who you talk to, the weight varies up to 500 lbs, but then we all know good ﬁshing stories). The Maverick also has a resident six foot Barracuda who comes and goes, but this is not the place to ﬁnd sharks. Cobias have often been seen down there and when you come across four or ﬁve of them you can easily mistake them for Nurse Sharks. Divers Dream & Divers Thirst are for the experienced diver. Both reefs are around the same depth of 9 – 15 metres. Currents are usually between 2 and 3 knots but can be more. There is a negative entry on to both reefs with very strong currents. Although not deep, this dive can certainly oﬀer the thrill of a fast drift and can only be done when the conditions allow and your dive time is unpredictable. Until you are down, you cannot tell the speed of the current, so you could dive the reef in seven minutes or you could be down there for an hour. This is a good spot for Eagle Rays, and to see a number of them swimming in formation is a sight to behold. Dream is a plateau which starts at around 8 metres. 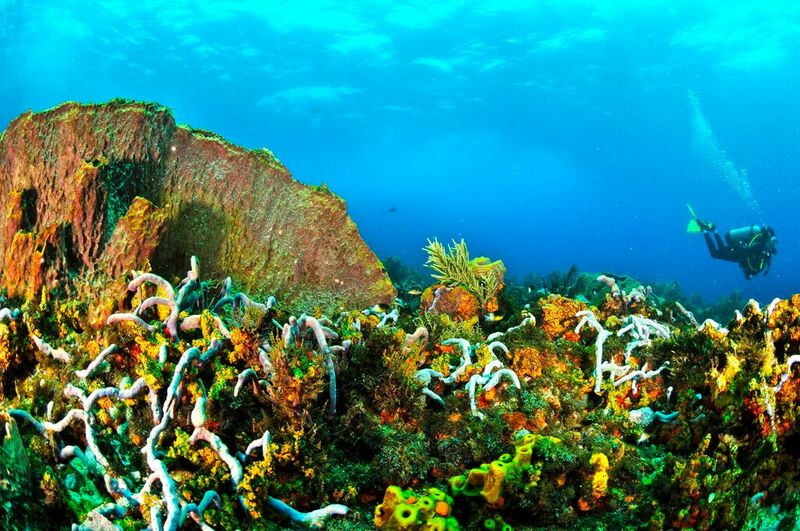 The reef is made up of hard corals in vivid colours with boulders that rise near to the surface. The currents at Divers Thirst are not usually as strong as at Dream, but you need to keep monitoring your depth gauge as you can easily be swept out to deeper waters. This site gets its name from the sea whip corals which resemble Japanese bonsai trees. It seems almost as if a Japanese artist sat down and painted his royal garden. This site features many hard and soft corals. It is a shallow sloping reef that begins at 30ft and tumbles down gracefully to 100ft. Just when divers are sure that their leisurely visit is complete, they encounter the “Kamikaze Cut.” The current picks up speed and you come barreling down towards two huge boulders, sure that the coming impact will spoil your day. However, you discover that a crevasse has been cut through the rocks and you pass between them, slow down, and ﬁnd yourself returned to the calm and tranquil waters of Tobago. Nurse sharks and large barracudas like to hang out near the small caves at this site. There are large brain corals and large schools of jacks. Ian Fleming, author of the James Bond novels, owned a house near here, on Goat Island. just off Little Tobago, Coral Gardens – also called Kelliston Drain (if done on the deep side) – features both hard and soft corals, but mostly the latter. Barracuda and trunkﬁsh are common here. What is believed to be the world’s largest brain coral calls this reef home. It is 14ft x 16ft in diameter – almost the size of a small house. Two stately nubs of black granite break through the surface providing the classic set of Bookends, but also make for rough surface conditions. A negative entry is required for this site. To start, you pass between the rocks into a large bowl, which is about 35ft deep. Look up and you will see the waves breaking over the bowl. It looks very similar to storm clouds passing overhead. Don’t be surprised if you see what looks like a large airplane shooting across – it’s just a tarpon; a school of these large ﬁsh has claimed this turf as their own. As you continue to drift at about 50ft, you will also see jacks, parrotﬁsh, trumpet ﬁsh, and grouper that live among the giant barrel sponges. The mild current propels you along a gentle sloping wall. The current seems to tease you by drawing you into deeper water. The Roxborough Hyperbaric Facility is housed at the Roxborough Medical Clinic and is used to treat decompression sickness from diving. It’s approximately 20 minutes drive from Speyside (northeast) and 40 minutes drive from Scarborough (southwest). While the facility is there in case of emergency, divers are always encouraged to monitor their bottom time and depth and to observe safe diving practices.